Yet another old bridge that carries thousands of commuters into Boston is about to go under the knife. This time, though, the benefits of the $100 million construction project will go to commuter rail riders instead of drivers. Last week, the Massachusetts Bay Transportation Authority issued calls for contractors to replace the rail crossing that ushers trains in and out of North Station. The crossing is actually two drawbridges joined side by side over the Charles River, with two sets of tracks on each. At 80-plus years old, they are worn, corroded, and in need of realignment after opening and closing for boat traffic. The project will also serve as a de facto expansion of North Station. Building a wider bridge with six rail lines will allow an increase in the number of platforms available for passenger service. The drawbridges are so narrow that they create a bottleneck for the 200 or so trains that go into and out of North Station’s railyard every day, leaving the MBTA without enough room to use two of 12 rail lines behind North Station. The plan is to improve traffic flow by replacing the four tracks with six, opening up two tracks and a platform at North Station that have never been used for passenger service. That would make room for more trains to enter or exit during rush hour and could allow more frequent service in the future. 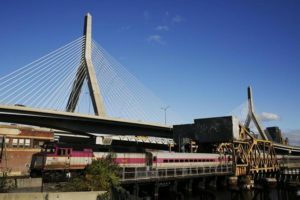 The T last week opened a bidding process for the design and construction of the project, which is estimated to cost at least $100 million and to take as long as until 2026 to complete. Designing the new crossing alone will take about two years. It will be the latest big bridge project underway or recently completed in Boston, adding another major construction site to the North Station area. Less than 1,500 feet to the east, work to replace the North Washington Street Bridge between Charlestown and the North End is just beginning. It’s estimated to take five years. And the Tobin Bridge is undergoing renovation, while the long-delayed reconstruction of the Longfellow Bridge was just completed. On the western edge of the city, the Commonwealth Avenue bridge over the Massachusetts Turnpike has received a new topping, and the state is in the early stages of replacing the big highway viaduct in Allston, a $1 billion-plus job that will take years. The T, meanwhile, recently finished replacing a drawbridge in Beverly for the commuter rail system and began replacing another one in Gloucester. Also at North Station, Causeway Street is undergoing a major makeover that has included the recent addition of a bicycle track down the middle of the road. And several new buildings have sprouted in the neighborhood, including nearly completed projects around TD Garden. The Charles River drawbridges are the only way in and out of North Station for trains, but Ray said the MBTA does not expect replacing them to interrupt commuter rail service. The T is leaning toward building three smaller bridges in stages, each holding two tracks. The first bridge would be built alongside the existing crossings, and then each of the older bridges would be taken down, one at a time, to keep four tracks in service at all times. The new bridges would also include a pedestrian walkway, linking the parks on either side of the river. The T has been considering the replacement project since at least 2015 but put money toward only this year, in the Baker administration’s five-year, $8 billion capital plan for the transit system. It has flown under the radar, compared to a much more ambitious proposal to expand the other major commuter terminal, at South Station. That $4.7 billion project would add seven tracks and four platforms to improve service south and west of the city, but it has been delayed for years because of complex negotiations with the Postal Service about relocating its facility next door. The South Station plan is also opposed by those who advocate a different idea: creating a rail connection between North and South stations. The so-called North-South Rail Link would cost $12 billion or more, state officials estimated earlier this year. The state is in the process of finalizing a study of the plan. The North Station project, however, hasn’t inspired criticism, said John Businger, a former state representative who advocates for the rail link, in part because the drawbridge is clearly in need of replacement. But he argued that opening more tracks is an inadequate way to increase capacity. “Anyone who’s thinking of expanding tracks at North Station or South Station to solve a congestion problem is heading down the wrong road,” Businger said. “It fills up again at those dead ends. We need to get rid of the gap” between North and South stations. The T is not currently considering any expansion of North Station beyond the drawbridge project, spokesman Joe Pesaturo said. He added that it would not preclude a North-South link in the future. Adam Vaccaro can be reached at adam.vaccaro@globe.com.